How to improve human performance. A spark that ignites the whole person. Move from stuck to transformed. A catenary is just a hyperbolic cosine. It's about the relationship between the wheel and the road. Identify both the wheel and the road. See us and get certified. Opinions on going green in the workplace. To explore everyday applications of leadership principles. Six to 30 participants divided into 3 to 5 teams. 30 - 90 minutes. Exact time requirement depends on the number of teams and the number of principles. Five leadership-principle envelopes. Write a leadership principle on the front of each envelope. Organize the participants. Divide the participants into four teams of three to seven members. Teams should be approximately the same size. Brief the participants. Review the five leadership principles. Explain to participants that the activity requires them to translate these principles into everyday on-the-job behaviors. Distribute the supplies. Give one leadership-principle envelope and four index cards to each team. Conduct the first round. Ask team members to discuss the leadership principle on the envelope they received, and to identify how this principle can be applied to on-the-job decisions and behaviors. Tell team members to write short sentences describing these application examples on an index card. Announce a time limit of 3 minutes and encourage the teams to work rapidly. Explain that the teams' response cards will eventually be evaluated in terms of both the number and the quality of the examples. Conclude the first round. After 3 minutes, blow the whistle to announce the end of the first round. Ask each team to place its response card (the index card with its application examples) inside the envelope and pass the envelope, unsealed, to the next team. Instruct the teams not to open the envelope they receive. Conduct the second round. Ask teams to review the leadership principle on the envelope they received, but not to look at the application examples on the response card inside. Tell the teams to repeat the earlier procedure and list the application examples of this principle on a new response card. After 3 minutes, blow the whistle and ask teams to place the response card inside the envelope and pass it to the next team. Conduct the evaluation round. Start the fifth round just as you did the previous rounds. However, tell teams that they do not have to write any more application examples. Instead, teams must evaluate the four response cards inside the envelope. They do this by reviewing the individual examples on each response card and then comparing the overall merits of the cards with each other. Teams have 100 points to distribute among the four response cards to indicate each card's relative merit. Announce a suitable time limit for this evaluation activity. Present the results. At the end of the time limit, check on the teams to ensure they have completed their task and have recorded on each response card the number of points awarded. Select a team at random to present its evaluation results. Ask the team to announce the leadership principle on the envelope and read the application examples on each card, beginning with the card that received the least number of points. The team should progress from one card to the next in an ascending order of the number of points. After reading all four cards, the team should announce how it distributed the 100 points and briefly explain the criteria used for distributing the points. Determining the Winner. Instruct teams to place all the response cards on a table at the front of the room; then call for each team to collect its cards. Ask teams to add up the points on their cards to determine their total score. Invite the members of each team to announce their total scores. Identify and congratulate the team with the highest score. What are the interesting patterns among the application examples? Can you find similarities among application examples related to different leadership principles? What leadership principle was the most difficult one for you to come up with suitable application examples? The easiest one? Why? Reflect on your workplace situation. Which leadership principle application idea could you implement immediately? More teams than envelopes? Prepare a duplicate set of the leadership-principle envelopes in the same sequence as the original set. Distribute the envelopes from the original set first and as many of the duplicates as there are teams. More envelopes than teams? Select a smaller set of envelopes with the more important principles. Introduce the other leadership principles during the debriefing session and discuss application examples. Too few participants? Conduct this activity as an individual game: Give a leadership-principle envelope to each participant and ask him or her to write application examples on response cards and to work through the steps. Not enough time? Stop the activity after the second round. Ask teams to pass the envelopes one more time and proceed immediately to the evaluation round. Skip the presentation of results and have teams pick up their response cards and add up their score points. Ample time? Give more time for writing the response cards and for evaluating them. Don't like the competition? Instead of asking teams to evaluate the response cards, have them prepare a consolidated list of leadership application ideas from different cards. Ask each team to write its consolidated list on a flip chart and present it to the rest of the teams. It took me just 10 minutes to design Leadership Envelopes , the training game featured earlier in this issue. It took me the same short period of time to design Stage Directions (October 2009), Participants from Hell (September 2009), Reaction Envelopes (July 2009), and Strength Envelopes (May 2009). All of these games were designed with the help of a framegame called Envelopes . What is a framegame ? It is a learning activity that is deliberately designed to allow easy loading and unloading of content. Just as you can mount different pictures in a frame, you can load different training content into a framegame. Here is the simple idea behind framegames: All games have both content and procedure. In Leadership Envelopes , the content is leadership principles. The game procedure involves reviewing a principle written on an envelope, and identifying how this principle can be applied to on-the-job decisions. The participants then write these application ideas on cards, place them in the envelopes, and exchange envelopes with other teams. They repeat these steps several times. If you remove all the content from Leadership Envelopes , you are left with the skeletal procedure. This content-free framegame is called Envelopes . You will find generic instructions for this game below. Prepare the envelopes. Create a set of envelopes, writing on the front of each envelope a stimulus (for example, a problem to be solved, a question to be answered, an issue to be discussed, a task to be completed, a graphic to be drawn, or a clue to be examined). Each envelope should have a different stimulus; however, every envelope should have the same type of stimulus. Prepare a rating scale. Create a checklist that identifies the criteria for comparing and evaluating different responses to the stimuli. In some games, you may skip this activity and ask the participants to conduct an overall evaluation of the responses using any criteria they prefer. Organize the participants into teams. To play Envelopes , you need at least three teams. Divide the participants into teams of more than two members and fewer than seven members. Teams should be approximately the same size. With fewer than six participants, play Envelopes as an activity among individual players. Seat the teams. Arrange the team tables in a roughly circular configuration. Explain that during the game, each team will pass an envelope to the next team in the clockwise direction. Brief the participants. Present (or review) the background facts and principles. Explain to the participants that the game requires them to apply these principles to different problems, issues, or questions. Distribute the stimulus envelopes and response cards. Give one envelope and several index cards to each team. Conduct the first round. Ask the members of each team to review the stimulus presented on the envelope and to think of a list of responses. Specify a time limit. Within this time limit, each team writes its responses on an index card in a brief but understandable form. The team is limited to a single card, but it may use both sides of the card. Each card will eventually be evaluated for both the quality and quantity of the responses it contains. Conclude the first round. Announce the end of the first round. Explain that each team should place its response card inside the envelope, leave the envelope unsealed, and pass it to the next team. Also, emphasize that the teams should not open the envelope they receive. Conduct the second round. Ask the teams to read the stimulus on the envelope they received, but not to look at the response card inside the envelope. Tell them to repeat the procedure of writing a list of responses on an index card. After the time limit is up, ask the teams to place their response cards inside the envelopes and pass them to the next teams. Repeat the procedure. Continue with more rounds of the game as time permits. Ask the teams to use the same procedure of inspecting the new stimulus, recording the response, inserting the card inside the envelope, and passing it to the next team. Conduct at least two rounds, and always stop at least one round short of the number of stimulus envelopes. Ask the teams to evaluate the response cards. If you have a rating scale for evaluating the response cards, distribute it. Ask that each team open the envelope, pull out all the response cards, and evaluate them. If you do not have a rating scale, ask the team members to use any appropriate criteria they want. With or without the rating scale, the team members should evaluate the responses on a comparative basis and distribute 100 points among the cards to indicate their relative merits. Scores should be recorded on the cards. Announce a suitable time limit for this activity. Ask the teams to announce the results. Randomly select a team to make the first announcement. Ask the team to read the stimulus on the envelope and the items from the response cards, beginning with the card that received the lowest score and progressing through the cards in an ascending order of scores. Finally, the team should announce how it distributed the 100 points and briefly explain the criteria it used. Repeat this procedure so that all teams get a turn to announce their results. Identify the winning team. Ask the teams to place the response cards on a table at the front of the room. Now call for a representative from each team to collect the appropriate response cards, and ask teams to compute their total score. Congratulate the team with the highest total score. Debrief the participants. Ask the participants to comment on the similarities and differences in the responses from the teams. Also ask them to identify which stimulus was the easiest to work with and which one was the hardest. Discuss the similarities and differences in the criteria used by the different teams for rating the response cards. Assign follow-up activities. Ask the participants to complete an assignment that requires the application of selected items from the response cards. 1. Brief the participants. (5 minutes) Present background facts and principles. Explain that the game will require participants to apply these principles to different contexts. Listen and take notes. 2. Organize teams. (2 minutes) Divide the participants into as many teams as you have different stimulus envelopes. Join your team and introduce yourself to the others. 3. Distribute supplies. (1 minute) Distribute an envelope and response cards to each team. Study and discuss the stimulus found on the front of the envelope. 4. Conduct the first round. (5 minutes) Give instructions. Keep time. Write a set of responses on a card. Place the card inside the envelope and pass it to the next team. 5. Conduct the next round. (5 minutes) Give instructions. Keep time. Write a set of responses to the stimulus specified on the envelope that you received. 6. Conduct more rounds (as needed). Give instructions. Keep time. Keep exchanging envelopes and writing more responses. 7. Evaluation round. (5 minutes) Give instructions. Keep time. Review the responses on the cards inside the envelope. Compare and evaluate the cards. You have a complete set of generic instructions for playing the Envelopes game. You also have several sample applications of the framegame in this issue of TGL and in previous issues. You have enough background information to rapidly create your own Envelopes game. So go to it now! In Human Performance Technology (HPT) jargon, an intervention is a strategy that improves the performance of an individual, team, or organization. To be effective, you choose an intervention that counteracts the root cause of a performance problem. For example, the most likely cause for your inability to read a fifth grade book in Tamil is your lack of skill and knowledge. The most appropriate intervention in this situation is training. You need to be trained on the basic knowledge of Tamil language and the skill of reading and understanding printed Tamil. There are hundreds of different interventions and this activity helps you explore some of them. It is a combination of a textra game (in which the training content comes from text materials) and interactive fiction (which involves creating, sharing, and analyzing your own stories). To recall and describe different interventions for improving human performance. Brief the participants. Explain how interventions are selected, designed, and used in the human performance technology process. Identify a few interventions that most participants are familiar with. Stress the importance of becoming familiar with a wide variety of interventions to increase effectiveness in performance technology. Distribute the Menu of 20 Interventions . Explain that this menu identifies 20 different interventions for improving human performance. Ask participants to scan the menu and check off interventions that they are familiar with. Distribute glossary items. Randomly hand out one glossary item for each participant. If you have fewer than 20 participants, you will have some items left over; if you have more than 20 participants, some items will be given to more than one participant. Ask participants to get ready. Ask them to read the glossary item given to them. Each participant should get ready to describe the intervention to someone else. Ask participants to underline key features of the intervention and to prepare an outline for their presentation. When ready, ask participants to roam around the room in search of another participant who is also ready. Conduct the first exchange. Ask participants to pair up. In each pair, ask one of the participants to present the description of the intervention she studied. The other participant should listen enthusiastically, ask questions, and take notes. When completed, participants change roles: The presenter becomes the listener and vice versa. Warn participants that they will be required to share their partners' intervention with someone else during the next round. Rewrite the story. When both participants have shared their interventions, ask them to reflect on what their partner told them. Ask each participant to identify the key features of the intervention and to prepare an outline for their presentation. When ready, ask participants to go in search of new partners. Conduct additional exchanges. When they pair up with a new partner, ask participants to repeat the process of sharing the most recent intervention that they learned from their previous partner. When the sharing activity is completed, tell participants to recall the explanation they heard and go in search of new partners and share the latest interventions they learned. Conclude the activity. After a suitable period of time, stop the conversations. Ask each participant to count the number of different interventions they have shared. Distribute the glossary that explains all 20 interventions. Encourage participants to study this handout at a later time and get themselves ready to learn more about different interventions. Assignment deals with the lack of alignment between performers and the tasks they are required to perform. This intervention involves placing round pegs in round holes by matching an employee's competencies with job requirements. The recent emphasis on strengths-based approaches suggests that jobs should be redesigned to leverage the talents of each employee, resulting in increased productivity and personal fulfillment. Balanced scorecard compensates for the lack of useful feedback. This intervention uses a framework for linking objectives, activities, and metrics at all levels of the organization for managing the overall strategy. The scoreboard provides a comprehensive view of the organization's performance in terms of several key indicators such as customer satisfaction, growth, learning, innovation, and financial returns. Coaching is an intervention that reduces the impact of performance problems due to lack of skills and knowledge. It may also be used to overcome a lack of motivation. In this intervention, one person improves the performance of another by questioning, collaborative goal setting, systematic observation, constructive feedback, and positive guidance. Computerization is a key element in reducing inefficiencies in work processes. This intervention supplements (or replaces) human performers with hardware and software to obtain improved, reliable, and consistent results. Specifically, computerization makes use of the latest technology to process large amounts of information in a rapid and reliable fashion. Culture change is an intervention that compensates for problems related to inappropriate values and dysfunctional social norms in an organization. This organization-wide intervention involves large numbers of people at different levels. It typically requires planning and redefining working relationships. Most culture change efforts incorporate future vision, whole-systems thinking, dissemination of information, participation of all employees, and continuous processing. Electronic performance support systems (EPSS) reduce the impact of performance problems due to lack of resources and lack of skills and knowledge. This intervention is a computer or online resource that is similar to printed job aids. EPSS provide just-in-time, on-demand information, guidance, examples, and step-by-step instructions to improve job performance without the need for extensive training. Feedback systems reduce performance problems due to lack of information. This intervention provides timely information about an employee's performance and its impact. Effective feedback should fit the type of performance and the preferences of the performer. Guidelines for improving the effectiveness of this intervention include these two key principles: Positive feedback (especially in a public setting) must be given soon after the performance in order to increase the frequency of the performance. Negative feedback (especially in a private setting) must be given as a piece of guidance immediately before the next opportunity to perform in order to increase the quality of performance. Goal setting is an intervention that deals with the lack of information and motivation. This intervention features all employees giving inputs to the organization's mission and goals, and aligning the objectives at different levels with the organization's overall strategic aims. The results of goal setting include clearer understanding of the organization's goals and how each employee contributes to achieving them. Human factors interventions compensate for the lack of appropriate tools and resources. These interventions use facts and principles from human physiology and cognition to design equipment in such a way as to improve the productivity and comfort level of performers. Facility design applies similar principles and procedures to design lighting, temperature control, ventilation, and furniture to improve human performance. Job aids reduce the impact of lack of resources and lack of skills and knowledge. This intervention includes printed checklists, decision tables, recipes, directories, work sheets, glossaries, samples, and flowcharts that are available to remind, guide, and facilitate the performer during a work situation. Job aids decrease the need for training and memorization. Knowledge management is an intervention that deals with the lack of skills, knowledge, and resources. This intervention involves creating, retrieving, and distributing organizational knowledge such as best practices. Computer data bases play a significant role in this intervention. New hire orientation reduces the negative impact of unclear expectations. This intervention provides new employees with complete and uniform information about the company, its vision and mission, functions and policies, compensation and benefits, rules and standards, and work requirements and safety. The outcome of this intervention is an increase in the confidence, loyalty, trust, and productivity of the employees. Knowledge management is a critical element in creating effective learning organizations. Performance appraisals reduce the impact of lack of feedback and unclear expectations. This intervention is an ongoing management process that includes defining and developing performance goals, designing appropriate measurement methods, and implementing the appraisal system. This intervention produces many positive outcomes including feedback, recognition, and career development. Process redesign reduces problems associated with the use of inefficient procedures. This intervention begins the development of a map to graphically depict the current flow of work as a sequence of activities toward the achievement of organizational results. Beginning with the customer's requirements as the final output, a process map identifies different inputs, decisions, activities, and outputs. The map is than reviewed and analyzed to remove redundancies, superfluous activities, and delays so that high-quality outputs are obtained at a lesser cost and a faster rate. Rewards and recognition are used in situations where human performance is negatively affected by lack of incentives. Typical recognition events include trophies, plaques, employee-of-the-month awards, announcements in the company newsletter, lunch with the president, certificates, personal notes from the CEO, gift certificates, and photographs on the bulletin board. Effective use of rewards and recognition require that they match with the achievement of business results and with the preferences of the performer. Salary and benefits (also known as compensation systems) are used to handle performance problems due to lack of incentives. This intervention includes policies and procedures related to payment made by organizations to individual performers for their work-related achievements. In addition to direct salary payments, compensation systems may include insurance, pension, stock ownership, and other such benefits. Selection is an intervention for reducing performance problems associated with misalignment of a performer with the required performance. This intervention involves gathering specific information about a candidate's past experiences and behaviors in such a way that they act as predictors of future performance. The process also involves ensuring that the candidate possesses the competencies required for achieving job-related goals. Supervision is an intervention that reduces the impact of lack of information and feedback. Effective supervisors and managers are knowledgeable about the job functions they supervise. They establish clear goals and standards, assign responsibilities and authority, and provide guidance and feedback to those employees who report directly to them. Team building is an intervention that compensates for the lack of efficiency in collaborative activities. This intervention increases the effectiveness of intact teams whose members regularly work together to achieve organizational goals. The process typically involves analyzing the strengths and weaknesses of a team, building on current strengths, reducing ineffective practices, and preparing a plan for ongoing team effectiveness. Guided by a facilitator, team-building activities involve clarifying the goal, specifying roles of different team members, providing mutual feedback, and increasing the levels of cohesiveness and trust. Training is a familiar intervention designed to cope with performance problems caused by a lack of skills and knowledge. It is one of the most frequently used—and misused—interventions. There are several alternative approaches to training (such as accelerated learning, action learning, e-learning, on-the-job training, and experiential learning). Proven guidelines for effective training recommend active and interactive processes. Leif Hansen is Chief Engagement Officer for Spark Interaction . For over two decades he has been combining collaboration with creativity to inspire, engage and connect individuals and groups. Helping people discover a deeper level of trust, support, purpose, fun and creativity in their personal lives and workplaces is what keeps Leif happy. TGL: So, how did you get into the world of games? Leif: I believe it started early with summer camps. I had a pretty challenging home life and so summer camps were a much safer home for me to develop personally. It was there that I discovered a magic I've since longed to repeat and to offer to others. This magic came from a mix of certain key elements, the safety that comes from a caring community, opportunities for creative expression, the beauty of nature, the freedom and acceptance in being one's silly self, setting goals with the support of others (the YMCA “rag ceremony”), camp-wide massive games, and the campfire magic where these would often all come together. TGL: Can you share one of those memories when it all came together? Leif: I remember playing a camp-wide game one evening that ended by bringing most of the campers and staff down to a more remote section of the camp beach. It soon became dark and a campfire was lit and songs and stories soon sparked to life. Towards the end of this segment a pirate story was told, when, right at the climax, we heard shouts from out upon the water and we saw a light on the mast of a boat. Pirates! A pirate-ship was coming our way! The story had come to life! I don't remember all the details except that they eventually landed on the beach, engaged us with their pirate selves, and shared a treasure chest full of S'mores. That was a magic moment. It is through portal experiences like that night when I realize that life is an adventure story, I realize the transformative power of creativity and play; I realize the importance of community, I realize the excitement of being fully engaged in the moment, and I realize how much I long to enter and offer similar experiences to others. TGL: Have you had an opportunity to re-create a similar experience? Leif: Yes, I've had a few very similar opportunities. Another opportunity was working with a group of teens and interviewing them about their various goals and fears. I would then work with the community we lived in to come up with weekly quests for these youth to embark on—alone or as a group—that would help them to face their fears or achieve their goals. There have been other related projects and interactivities, but those two were the most parallel to my magical pirate night. I'm happy to report that all elements of that early camp magic are present in various combinations in all my work with Spark Interaction—whether helping people who work with groups to be more engaging and conscious of community-building, building deeper trust with teams, coaching creative breakthroughs, presenting to groups, or holding various theme-based workshops like SoulTech. TGL: What exactly happens in your SoulTech workshop? Leif: I've received a surprising amount of attention around these workshops—from the LA Times, to being featured on the Today Show, to being on a recent PBS online panel. They seem to be touching a national nerve about our increasingly techno-centric culture. SoulTech workshops, though they've had a few different names, are basically about helping individuals and organizations to become more productive and healthy in their relationship with technology. We do this by giving people a safe, structured, and collaboratively creative space to align their personal or organizational values and goals with how they actually use technology. Technology is evolving at such an astounding rate that many of us haven't had, or taken, the time to reflect on how much it's really affecting our personal lives, families, and workplaces. These new social and informational technologies are powerful, but as we all know, as power increases, so does our need for responsibility. If not, we may inadvertently end up becoming tools ourselves, or worse, negatively impacting those we care about. TGL: Yet you also promote these dangerous new technologies? Leif: Yes, I get teased endlessly about my apparent hypocrisy. It would be hypocrisy if I hadn't stated from the beginning that these workshops arose out of my own struggles or if I hadn't continued to stay transparent about my learning process. The fact is that I love new technologies, and yet I also hate them, or at least I am concerned about them. My other business, Spark Social Media, has been primarily focused on helping people to use social media to build online communities and on teaching and training individuals and organizations about the power of social media. However, I'm hoping to gradually shift my tech emphasis to offering social media as a secondary layer of the multi-modal or hybrid learning experiences I offer. TGL: What is “multi-modal” or “hybrid” learning? Leif: It is emphasizing the power and necessity of embracing both real-time experiences and virtual experiences. Many people tend to emphasize only one, but I think they are missing out. Real time experiences, particularly when they involve Playformation (improvised play that brings transformation), enable people to connect and grow on much deeper levels than virtual experiences. However, social technologies do some things that real-time experiences can't do as well. TGL: Like what? How can social technologies add value? Leif: Social Technologies help people to stay connected after (or before) their real-time experiences, continue the conversations they have started, invite others in from all around the world, share their learning (through text, pictures, audio, and video), democratize their sharing activities (through voting and other approaches), remain transparent and accountable, and accomplish much more. TGL: Sounds good, so let's hear a bit more about Leif. What inspires you to wake up each day? Leif: Well, I'm either motivated by an endless list of fears my ego has been rehearsing or I'm inspired to action by a deeper desire to listen to my heart and enter life's adventure. Unfortunately, most days, I start by listening to my ego and become fueled by fear. After burning out on that, I make a shift to the good juice by receiving inspiration, love and guidance from my spiritual practices or my support network of family, friends and peers. TGL: What does it mean to you to “listen to your heart”? Leif: Listening to my heart means first and foremost trusting. Trusting that life is ultimately good and that all things, even the ones that seem stressful and undesirable, are actually gifts in disguise. There's a great term I've picked up for this paradigm—“Pronoia”. Pronoia is the opposite of Paranoia, so it could be said to mean “The sneaking suspicion that the universe is conspiring to bless you.” Without this deep hope, I've notice that my ability to trust, receive love from my community, serve others, be creative, play or stay in a productive focused flow, is no where near as effective and enjoyable. Pronoia, or at least what it reflects to me, is the foundation for my vision and mission. TGL: And what vision is that? Leif: I'm excited by a vision of a world where people and organizations feel safe enough to discover their core passions and take the risk of creatively expressing them. In that world, people also remain curious, respectful and supportive of the passions of others. Imagine what kinds of experiences, engaging conversations, relationships, and awe-inspiring creations would come from a world community like that! TGL: And how does Spark Interaction help bring about that vision? Leif: You could condense Spark's simplest core message down to igniting a deeper level of safety, freedom and trust (in oneself and in others). We bring this spirit into our training sessions, coaching, presentations, CoLabs (ongoing collaborative support groups), and workshops. How do we do this? By striving to be honest and authentic, and sincerely caring for those we serve, we help create environments of safety and trust. And it has been proven without a shadow of a doubt that when trust is high, productivity is high, cost is low, and things move faster. By using a process I've been calling Playformation, I engage people and groups in a creative, enjoyable, collaborative, whole-minded, playful manner. Many of the activities and exercises I use come from the world of improvisational theater. And by nurturing my own personal and spiritual development, I am able to continually grow and receive inspiration that enables me to engage, inspire, and empower those I work with. With those priorities and practices in place, those we work with share increased creativity, innovation and productivity in their work and personal lives; increased trust, communication and care in their relationships; feeling more prepared and empowered in their decisions; more & better clients, increased revenue, and increased satisfaction in their personal lives. TGL: How can people find out more about you and your services? Leif: I find much more progress can be made in a conversation, so my preference would be a phone call. Please call me at 1-877-I-Am-Game. You can also email me at leif@sparkinteraction.com . An Individual (or spokesperson for a team) facilitates the creation of two different sculpted scenes using people in the room. The people involved in the sculpt, which may include the original sculptor, then improvise how the transformational journey from the stuck sculpt to the transformed sculpt takes place. Any person or group feeling stuck and wishing to experience transformation. Ask for a volunteer or group representative. Instruct this sculptor to briefly describe the stuck situation. Instruct the sculptor to start creating a literal or abstract sculpture using other people. The sculpture might be a scene, a machine, an abstract feeling, or anything else. The sculptor may request movements or sounds from the people to incorporate in her sculpture. She basically directs the sculpted scene until it feels like it represents the stuckness. Instruct the sculptor to repeat steps 2 to 4, on the other side of the room, to represent the desired outcome or transformation. Once the sculptor is satisfied with how both sculpts look, ask her to re-create the first stuck sculpt scene. Ask the people in the sculpt to improvise moving across the room and changing into the transformed sculpt. The sculptor may offer direction on this journey, but is encouraged to let the group primarily use its own brilliance. Debrief the sculptor and the group about what they observed and experienced from the process. Reprinted from the September 2009 issue of Firefly News Flash by permission of the author. In this month's News Flash, we share insights about having a smooth ride no matter where you're going or how you're traveling. We begin with this 99-Word story about the importance of synchronizing with your environment. When I first learned to square dance, I was very tense. If I made a mistake, the caller would usually say something to make me look even more foolish. Then I met Peter Amidon. Peter always makes a point of putting the dancers at ease. He teaches simple moves that are easy to remember and he always begins by making sure each dancer knows where their home base is. Excellent advice anytime we feel uncertain and out of sync! The wheel is often cited as being one of the most important inventions of early humankind. Its use gave people the ability to move very heavy objects with much less effort. As it evolved, the wheel facilitated trade, exploration, and warfare and is used in nearly every mechanical device. But you know all this. I don't need to state the obvious. To do so would be unnecessary. No need to reinvent the wheel, right? Besides, somebody else already has! Searching the Internet for images to use for last month's News Flash, I stumbled upon this photo of a square-wheeled tricycle that actually works! 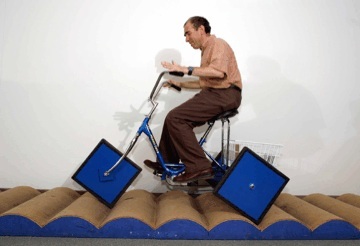 Mathematician Stan Wagon, of Macalester College in St. Paul, Minnesota created this contraption that offers as smooth a ride as any round-wheeled vehicle. The secret is the special track designed for the specific dimensions of his right-angled wheel. The bumps you see here are based on the graph of a hyperbolic cosine, which is the shape you get if you let a rope dangle loosely from two supports. Mathematicians call it a catenary. Turn it upside down, and you get a lumpy track perfect for angular wheels. Turns out you can reinvent the wheel—as long as you reinvent the road too! You can make a wheel just about any shape you want as long as you match it to the corresponding catenary road. If you make a five- or six-sided wheel, the bumps in the track need to be smaller. As you increase the number of sides of the wheel, it looks more and more circle-like. Correspondingly, the bumpy track will get flatter, looking more and more smooth. Wow, soon you're back to where you started: a perfectly round wheel needs a perfectly flat road. This suggests that rolling is really about the relationship between the wheel and the road. If things don't roll along smoothly, it's because of an incongruence between wheel and road. When that happens, adjustments will need to be made in either the wheel, the road, or both. Which will you alter? If you are committed to a particular wheel, like one that can carry a very heavy load at high speeds, you'll make a special road or a track—a railroad, perhaps. If you are committed to going over a particular uneven terrain like stones or sand, you'll modify your wheel with fat balloon tires. And if you want to carry heavy loads over all types of terrain, you'll modify both track and wheel by combining them into a caterpillar tread! So Stan Wagon's cycle is a nice reminder that we cannot grasp the importance of the objects or events around us in isolation. Their real significance lies in the relationships they form between each other. Whether at work, at home, or at play, small problems are liable to surface in any project or process. Though we might need to stop and smooth things over, usually we can just keep rolling along. Other situations call for serious maintenance with an experienced road crew and economic stimulus money from the Feds! As suggested in the Ideas section above, when you encounter bumps in the road, the problem is not just the road. The wheel is also a factor! Consider, for a moment, what might be causing the unevenness in relationships like these. Which is the road and which is the wheel? Notice that even just considering the relationship between road and wheel opens up more opportunities than only trying to fill the potholes. So here's this month's activity. Whatever type of wheel you're riding, acknowledge that you're moving along the ground; you're on a road. Try to identify both the wheel and the road of each situation in which you find yourself. Challenge yourself to describe the relationship between that particular road and wheel. Then figure out what needs to change to get the proper match for a smooth, efficient ride. When you get to that point, please, send us a note (email Brian) and tell us what you've learned! At the NASAGA 2009 conference, Scott Nicholson received the Rising Star award. He definitely deserves it. Every evening, he had many participants (including our Assistant Editor) staying up late and playing board games with him. You can learn more about Scott's scholarship, career, toys, travel, and other things by visiting http://scottnicholson.com/ . He will also be featured as a Guest Gamer in an upcoming issue of TGL . Scott is the charming and knowledgeable host of Board Games with Scott ( http://www.boardgameswithscott.com/ ), a video series about different types of board games. (Actually some of them are card games that do not use a gameboard.) Once a month, Scott puts out an episode in which he describes a different game and walks you through the flow of play. Watching the game in action is much better than reading a review. After I watch an episode, if I like the game, I immediately go ahead and buy it. Scott does not waste his time (and yours) with negative reviews of bad board games. Scott's episodes are not about training games. They deal with commercial recreational games. Here's a sampling of the games that are included in his episodes: Hoopla , Heroscape , Why Did the Chicken…? , The Big Idea , Cleopatra and the Society of Architects , Apples to Apples , Timbuktu , Lifeboats , World of Warcraft: The Boardgame , Metropolys , Say Anything , Battlestar Galactica , and Word on the Street . In my facilitator-training workshop, I give different games to different teams and have them conduct the game with the other participants. I select the games based on Scott's reviews. I also ask participants to watch the relevant episode to get an overview of the play of the game. I learn about new game design principles and procedures by watching Scott's episodes. I incorporate them in the training games that I design. I buy multipurpose games (such as Say Anything ) reviewed by Scott and create content cards that are related to my training topic. Visit Scott's web site. You will find it useful in many different ways and you will definitely find it interesting. Would you like to be certified to conduct a Thiagi workshop? If you answered, “yes”, then you're in luck. For the first time, The Thiagi Group will be offering a certification program to teach our training methods. Just participate in a one-day workshop (chosen from four content areas), followed by a one-day certification session. That's all there is to it! “When and where,” you ask? Well, that is where we need your help. In the spirit of “letting the inmates run the asylum”, we want you to decide when and where to hold our first session. You can do this by responding to this month's survey. We will print the results in next month's newsletter along with additional details about the certification program. Last month we asked you for your opinion about going green in the workplace. Here are the results. Response 1) http://storyofstuff.com/ Watch this animated movie. Response 6) I have started putting hefty handouts on a website. I strongly recommend to participants to read them on the computer screen rather than print them out. Response 12) It's not just a bandwagon thing that you can use to improve your reputation. It is also a way to increase connectedness, motivation and satisfaction in co-workers. I feel that trainers should especially reconsider their environmental footprint through traveling. How many of us are zooming around the country by plane, from one training to the next conference? We could try to group and coordinate stunts out of town and overseas, use videoconferences, go by less environmentally devastating means of transport or, at the very least, set off our CO2 emissions. Thank you for your responses. It is not too late to see more of the readers' responses or add your own.